Ah, the power of video. Nothing replaces the sheer impact of full motion video with strong audio. It truly makes a sensory connection with your audience in a unique way. Now, you can use NetXpression to communicate with your audience as if you were there. Video is compelling, exciting, convincing. It somehow makes your presentation more complete. Now, adding video to your online presentation has never been easier or faster. View our sample video presentation to see how to engage your audience in a new and meaningful way. 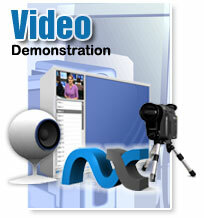 With NX, you can publish a high quality video presentation in just minutes. Really!